The franchise company must allow the Franchise Research Institute (FRI) to contact every individual/distinct franchisee (including those which have purchased a license, but not opened a location) and give them the opportunity to participate in the survey. A minimum of 70% of the franchisees must complete the FRI confidential survey. A survey is a “snapshot” of franchisee opinions at a specific point in time, and as such it is of decreasing value as time passes. Therefore, we require franchise companies to resurvey annually to maintain certification. In general, how would you rate the overall quality of your franchisor? Knowing what you know now, and if you had it to do all over again, would you buy this franchise again? Would you recommend this franchise to a prospective franchisee? My franchisor and I are committed to a positive, long-term relationship. My franchisor understands that if I am successful, they will be successful. My franchisor is a competent, skillful organization which I rely on for help. Please rate the initial training supplied by the franchisor. Circumstances of concern include franchise companies that have been franchising for too short a period of time or have too few franchisees (or both), which makes it difficult to acquire enough useful data. These issues will be reviewed on an individual basis; however, it is extremely rare to certify a World-Class Franchise that contains fewer than 20 franchisees, or that had not each been open for two years or more. 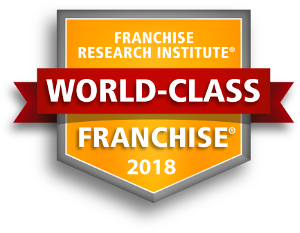 The Franchise Research Institute reserves the right to make minor exceptions to the above criteria for franchise companies which have been certified as World-Class for at least three years. This serves to reduce (or eliminate) the potential for bias brought about by temporary circumstances (i.e. technology conversions, rebranding, leadership changes, etc. ).